Home » Auto Accidents » Is Nevada a No-Fault State? As soon as you’re in a car accident in Nevada, you have questions about Nevada car insurance and how the claims process works. You might have heard of no-fault auto laws and wonder if no-fault rules apply in Nevada. Nevada uses an at-fault system. 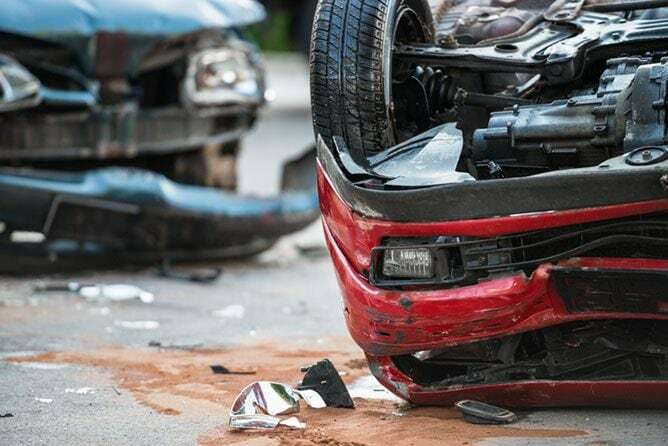 In Nevada, when you’re the victim of any car accident, you can work with your personal injury lawyer to bring a claim against the responsible driver. Here’s what you need to know about no-fault laws and whether they apply in Nevada. Nevada is not a no-fault state. In Nevada, the person responsible for causing a traffic accident pays for the damages. While you may still purchase insurance that kicks in if the responsible party is uninsured or underinsured, you can bring a claim against the responsible party from the very first dollar if you’re hurt in a car accident in Nevada. Las Vegas is not no-fault. In Las Vegas, you can bring a claim against the responsible party any time you’re the victim of a car accident. Las Vegas is in Nevada, and the same at-fault car accident laws apply in Las Vegas that apply in the entire State of Nevada. What Does It Mean to Be an At-Fault State? When you’re hurt in an auto accident in an at-fault state, you can sue the other party any time you’re injured. There isn’t a minimum threshold for your injuries or damages that applies for bringing a legal claim. Instead, in theory, you could bring a legal claim against the other party even if you had only $1 in damages. In no-fault states, you can’t bring a claim for auto accidents that fall below a certain threshold. Usually, the threshold is the seriousness of injuries. Below the limit, you have to rely on your own insurance to cover your losses. In no-fault states, the theory is that it’s better for society for everyone to have their private insurance cover minor claims instead of pursuing adversarial claims and litigation for every case. Because Nevada is not a no-fault state, the minimum threshold rules for bringing an auto accident claim don’t apply. Nevada law says that you can bring your claim against the responsible person no matter the value. There’s no inquiry into whether your case meets minimum requirements or whether your injuries are severe enough to justify bringing a claim. The reason for an at-fault system is the argument that the responsible party should pay for the results of their actions, and an at-fault system gives people an incentive to drive carefully at all times. Even though Nevada is not a no-fault state, there are still mandatory insurance minimums that apply to all drivers in Nevada. You don’t have to have no-fault insurance, but you must have insurance that covers you in the event that you cause an accident. You must cover your liability to others if you’re responsible for personal injuries and property damages in an accident. Of course, it may be appropriate for you to carry more insurance than the required minimums. Because Nevada is an at-fault state, a large part of the inquiry for a Nevada accident is sorting out fault. Sorting out who is at fault for the accident is a critical part of proving your claim. In some cases, there may be multiple people who share blame for a crash. If you’re involved in an accident, it’s important to pay attention to proving fault and issues of comparative fault. With Nevada being an at-fault state, how you handle the immediate aftermath of an accident can be critical to getting a fair recovery for your claim. Because it often comes down to who is at fault for causing the crash, it’s important to do what you can to preserve the evidence at the scene. You should immediately call the police and take photos of the accident scene. The law requires you to exchange information with the other driver, and it’s essential that you get their contact information. Witness information, a police report, and your own photos can all be helpful in proving fault for your accident. The sooner you can work with an experienced injury attorney, the sooner they can help you to preserve evidence that’s critical to your claim. When you understand that Nevada uses an at-fault system instead of a no-fault system for auto accidents, you can take it into account when you approach an insurance company for a settlement. It’s the insurance company’s goal to pay as little as possible for your claim. They may try to convince you that you’re at fault for the accident even if the other party is legally to blame. Don’t be fooled by the insurance company’s tactics! The first offer from the insurance company might be highly inadequate compared to the actual value of your claim. An experienced Nevada accident attorney can help you evaluate any offers that you receive from the insurance company. Your attorney can also help you respond to an inadequate offer and negotiate for the real value of your claim. Because Nevada is an at-fault state, you can include the full value of your claim based on traditional negligence laws. You aren’t limited to making a claim that values only your medical bills or your economic losses. Instead, pain and suffering can be an essential part of your claim. Valuing your pain and suffering can increase the value of your claim significantly. It’s important not to assume what the value of your claim is worth until you speak with an experienced lawyer. Our team of legal professionals has years of experience helping accident victims navigate Nevada’s complex car accident laws. We understand the ins and outs of Nevada’s accident laws, including Nevada’s at-fault accident laws. Let us help you build your case and make sure that you get a fair payment for your claim. Our team is standing by to talk to you today.